The Urban Politico: The Notorious A.I.G. "One two three four five six seven eight nine..."
Gotta go gotta go, more Banks to bailout, word up, uhh"
OK so we kinda talked about this a little bit earlier in the week before AIG's CEO testified in front of Congress last week, but this is still something that is emblematic of the entire problem of late. 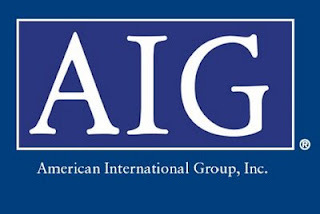 AIG is an insurance company like Prudential or Allstate. Now take Allstate for example...they insure automobiles right? You buy a car, the state makes you get insurance on that car, and the insurance company looks at your car and says, ok your car is worth $20,000, we have $20,000 so we will insure your car if something should happen to it. AIG decided that it would be a GREAT idea if it jumped into this whole sub-prime mortgage backed securities circus and started providing insurance policies to financial banks like JP Morgan Chase, Goldman Sachs, Lehman Bro's, etc. for all the tons of money that they were sucking out of the American public. Unlike Allstate that had $20 G's on hand to insure your Ford Focus, AIG had NOW WAY IN HELL to back up the level of money that was needed in order to insure the Lehman Bro's of the world. And they KNEW THIS before they issued these policies. But they did it anyway. Why? Because they assumed that the worst case scenario would be maybe one or two financial giants coming to them for money at the same time. Instead, ALL of the financial firms came to them at the same time. Thus, AIG goes broke and crawls on their hands and knees to the Federal Government who allowed them to get too big in the first place. ...AIG decides to take a piece of this pie and give $165 million of it (million with an "M") to the very friggin geniuses who came up with the ideas that got them into this trouble in the first place. Congress decides to RE-act (as opposed to being pro-active) and decides to pose a special tax on the people who got the bonuses. Problem with that is, that is the classic definition of what is known as a "Bill of Attainder" which is unconstitutional. Not to mention it's a tax that is taking place after-the-fact which is also unconstitutional because it is "Ex Post Facto." 1. Will we ever get the bonus money back from these cats? 2. Should we even try? 3. Does the fact that this entire mess happened in the first place finally put the nail in the coffin to the entire concept that the unfettered capitalist market is in the best interest for America? 4. Should AIG even paid out the bonuses in the first place? 5. Should Secretary of Treasurer Tim Geitner resign? 6. Is American, in general, OVER-reacting to the way business is done on Wall Street?